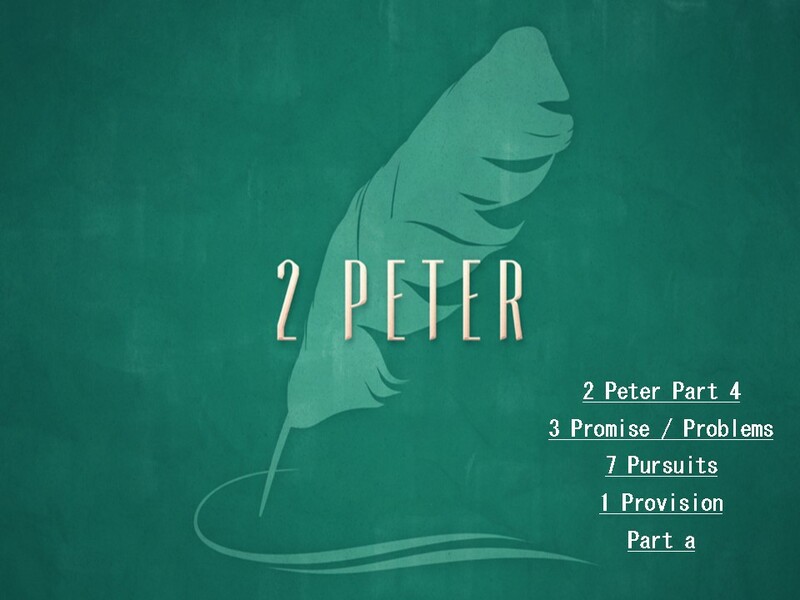 As we saw last time, Peter is wanting his readers to get a full grasp of what it means that upon Jesus’ resurrection and ascension to His throne – He sent the Holy Spirit to take up residence in the soul of the Believer. He mentions this in vss. 3 & 4. By His own glory and excellence – because of how wonderful He is and according to the power and authority He possesses, He has fulfilled precious and very great promises to us, which promises, make us partakers of the divine nature. Believers gain the reality of God’s own Spirit indwelling us and empowering us to live life as He has designed it for us – in godliness. Even in the midst of this fallen, broken world, and the present corruption that surrounds and impacts us. The indwelling Spirit of Christ is in fact the single great PROVISION He has given to the Believer – but we are so woefully unaware of His presence and the need to consciously depend upon Him in our prayers and daily life – that we can lead lives which barely demonstrate His presence within us at all. Sadly, I can identify with that at times in my own life, and have observed it so in the lives of many others. The PROMISE here is, that IF the qualities he just mentioned – and which we hope to unpack in days to come – are fully ours, and are increasing – then we will avoid the dual PROBLEM of being either ineffective or unfruitful in the knowledge of our Lord Jesus Christ. And there can be a negative INTERNAL result: Being UNFRUITFUL or failing to have any of the fruit in my own soul of knowing Christ. I neither grow in His image myself, nor contribute to anyone else’s growth in Christ. We can become spiritually inert. This state of affairs is accompanied by a brand of forgetfulness in the Believer that is spiritually paralyzing. i.e. What I’ve been saved FROM and saved TO – has lost its impact on me. My deliverance from the penalty of sin has become ho-hum. It no longer amazes me or fills me with gratitude or awe or wonder. We’re just coasting spiritually. And that is a recipe for disaster. It will make us wholly ineffective in impacting anyone else’s soul for the Gospel, and it will make us fruitless; famished, unsatisfied, emaciated and parched in our own souls. Maybe that is you today. You’ve been a professing Christian for decades, but you find that in truth, you either contribute little or nothing to the spiritual growth and welfare of any other Believer – nor have you shared the Gospel with any non-Believer. And in truth, your own soul has dried up so, that consistent Bible reading is a non-productive bore – or even a guilt inducing burden. You haven’t wept in prayer in months or years. Worship is a rote responsibility instead of a refreshing refuge. You’ve lost all interest in or put precious little time or effort into pursuing spiritual matters. Because you HAVE been miraculously born again; because you HAVE been cleansed of your sin and guilt; because you HAVE been given the gift of God’s own Spirit to indwell and empower you to live this amazing life of God here and now – MAKE EVERY EFFORT. Well, in his perverse way he said the truth of Peter’s point here – the Christian life that is not attended to and labored over, with be no good to anyone – including oneself. All of us who have walked with Christ for more than 5 minutes have faced the reality that we are exceedingly prone to fall into sin – and especially back into the sinful patterns of thinking and acting that were so ingrained in us before our conversion. Lying. Self-service and self-protection. Lust. Greed. Fear. Materialism. Anger. Need to control others. Laziness. Self-absorption. Drunkenness and addiction. Neglect of spiritual disciplines. Self-reliance demonstrated in prayerlessness. Selfishness. Pride & Arrogance, Contentiousness. Disrespect. Rivalries. Impurity. Unmindfulness of spiritual matters. You name it. And here is an extraordinary revelation: The key to keep from falling back into sin, is to be making every effort to supplement our faith with the qualities he mentions here – by the Spirit. The way to stop sinning in our problem areas, is not to concentrate on the sins themselves – but to do something else altogether – to walk in the Spirit. And Peter shows us here what exactly Paul meant in Gal. 5. One walks in the Spirit when they give themselves over to looking to Him while pursuing virtue, knowledge, self-control, steadfastness, godliness, brotherly affection and love! It is the old principle we’ve seen so many times before. If a light switch is off, it can’t be on. If the Bible said: “Thou shalt not walk south” – then I need to NOT spend all of my time thinking about how NOT to walk south, I need to walk north! And by virtue of walking north, I CAN’T be walking south. I cannot be sinning against a neighbor I am loving at the same time. This is a far cry from our fallen, human intuition. But it IS God’s Word and must be true. And it is to this PROMISE we must turn, if we are to deal with the PROBLEM of our sins. Which then leads us to our 3rd PROMISE / PROBLEM. And Peter’s point here is both subtle and profound, building off of Jesus’ and Paul’s teaching in an area that is all but ignored in our day. Once again let me cite Michael Green as I think he says it quite well: ‘This passage agrees with several in the Gospels and Epistles in suggesting that while heaven is entirely a gift of grace, it admits of degrees of felicity, and that these are dependent upon how faithfully we have built a structure of character and service upon the foundation of Christ.’ Michael Green, 2 Peter and Jude: An Introduction and Commentary, vol. 18, Tyndale New Testament Commentaries (Downers Grove, IL: InterVarsity Press, 1987), 96. In other words, there is a complete lack of understanding that God has appointed rewards for our labor and striving, and that those rewards are to be valued by us as worth our effort to obtain, even if they are not enumerated for us or described in detail. They are worth our effort, simply because He says they are. Jesus taught explicitly on the same theme: Matthew 6:1–6 “Beware of practicing your righteousness before other people in order to be seen by them, for then you will have no reward from your Father who is in heaven. 2 “Thus, when you give to the needy, sound no trumpet before you, as the hypocrites do in the synagogues and in the streets, that they may be praised by others. Truly, I say to you, they have received their reward. 3 But when you give to the needy, do not let your left hand know what your right hand is doing, 4 so that your giving may be in secret. And your Father who sees in secret will reward you. 5 “And when you pray, you must not be like the hypocrites. For they love to stand and pray in the synagogues and at the street corners, that they may be seen by others. Truly, I say to you, they have received their reward. 6 But when you pray, go into your room and shut the door and pray to your Father who is in secret. And your Father who sees in secret will reward you. ‘Crown’ there being a reference to the victor’s crown awarded in the ancient games – having striven and won. The healthy Christian life wants a ‘richly provided’ entrance into the eternal kingdom, and not just some slipping in through the back door! It betrays whether or not we in earnest love pursue those things that bring a smile to our Heavenly Father’s face, or whether or not we just don’t care, as long as we get there. But the PROMISE here is – that if we give ourselves to the earnest and energetic pursuit of the qualities he has laid out before us – we WILL receive a lavish entrance into that glorious, eternal Kingdom one day. Knowing that his own death is looming over him and will be soon – this, by the inspiration of Christ’s own Spirit, he is compelled to give his readers and us as of the most vital importance. How much then ought we to give heed to it, to take it in, understand it and adopt it as essential to our own Christian lives. Salvation is truly by grace and grace alone. But we were not saved just to sit fat and happy in a bare pardon from sin. We were created for higher things than these. Things we are by God’s grace and through is Spirit to lay hold of and give our lives to. We are left with two things at the end of this. If you ARE a Christian here today, how does your current state accord with what we’ve just discovered? Are you INEFFECTIVE & UNFRUITFUL, or IMPACTING OTHERS FOR THE KINGDOM & GROWING IN GRACE? Are you facing and overcoming sinful patterns in your life, or falling more than you are walking? Are you striving for a richly provided entrance into His Kingdom? Or just content to hope you make it? This may then be a wake-up call for you – a moment of grace whereby God calls you to repent and recover your first love. Maybe you have THOUGHT that you were a Christian, but truth be known, as you consider these things honestly this morning – you really know nothing of the kind of mindset that’s been unfolded here. In truth, you still need to be born again. You still need to run to Christ to be your sin-bearer, and to grant you the new birth He gives to all who come to Him for mercy in faith. And you can do that right where you are this very moment – in acknowledging your lost condition, and calling upon God in Jesus name to forgive you and make you a new creature by His power.